Read Part 1 on how to work remotely from Bali as a digital nomad HERE. Read Part 2 on why I believe a retreat is a game-changer for any digital nomad (aspiring, new or seasoned) HERE. Arriving in Bali on November 4th, I had no expectations. I had just journeyed over 30 hours to meet my PACK (of digital nomad peeps) in Ubud, bringing my laptop and phone – AKA my business – in tow. Maybe it's best to always enter a new situation with zero expectations? Because what followed was a month of *explosive* surprises. 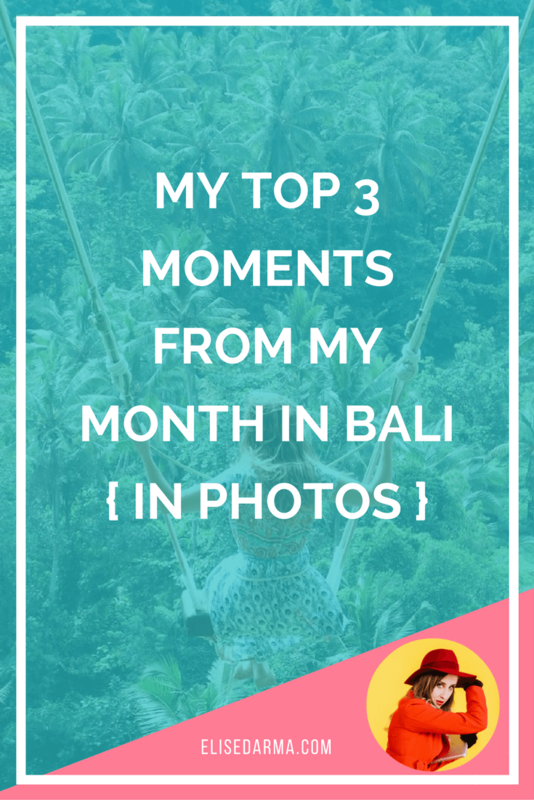 Here are my top three favourite moments from my month in Bali with PACK. If you follow me on Instagram, you probably already know that Bali is an INSTAGRAM. HEAVEN. One of my favourite aspects of my trip to Bali with PACK was being able to see so much of the beautiful island. Here are highlights of what I LOVED seeing in Bali. Ubud is a hub of Bali for good reason. The amount of gorgeous sights in close proximity to the town is crazy. Here are some of my faves. What's more satisfying than getting up at 2:00am to climb a volcano in the pitch black to see the sunrise over Mount Agung (right before it erupted)? It might sound hellish but believe me when I say –– it was worth it. You've probably seen this view from someone's post on Instagram (teehee) but viewing it with your own eyeballs is indescribable. What's better than crawling through some sandy caves to discover a shipwrecked beach and be delighted with the most spectacular sunset? Guess where we’re headed on my next digital nomad retreat? One small, magical word: BALI. If you've already read Part 1 and Part 2, then I sound like a broken record here. But having my business baby, InstaGrowth Boss, featured in Forbes was a *pinch me* moment. I mean, after 3 years of intense hustle, learning and scaling, the fruits were starting to appear. Online business freedom really is a long game. I see so many people hustling a day job and a side biz to make it happen... and it might feel like the wins are few and far between... but I say: keep going. I do believe that those who stick with it to build a biz with solid foundations get there one day – whether it's in 6 months, 1 year, or 3 years (just not overnight 😉). The other cool thing that happened in my business while I was in Bali? I taught my Instagram masterclass IN PERSON for the first time ever at Hubud. Another full circle moment as Hubud was my goal when I worked in a 9-5 back in 2013. I was dying to work from Bali and so when I reached Hubud at the start of 2015, it was a dream come true. So to come back almost 3 years later and teach a class at the same place... like, woah. Lastly, from a hard numbers perspective, I'll mention this other win. I was working probably half the hours I normally would and yet, because of a promo I ran for Black Friday and Cyber Monday, November was my best sales month all year. I definitely had more *pinch me* moments as I'd be out and about Ubud, riding around on my scooter, and still getting notifications on my phone of sales coming in. This is exactly my goal for myself and for all those I work with, whether in my coaching or courses. Rounding out my third favourite moment from my time in Bali is having the chance to see Mount Agung erupting with my own eyes. I had heard the news of the eruption starting right before our early morning Mount Batur hike. From Batur, I could see Agung in the distance with a little steam coming out of it. Then a few days later, I heard the news of the major eruption. And the next day, it became very, very real. While we were back in Ubud and masks were being handed out as a precaution, a group of us from PACK decided get up early the next morning and drive towards the volcano to get a better look. We honestly didn't know if it was the stupidest idea or an opportunity that couldn't be passed up. You can read the full story of that morning here in my Instagram caption, but in short, it was pretty spectactular. While we as tourists were safe and were able to see some stunning views of the volcano erupting, it really highlighted the peril that the locals living around Agung were in. Thousands of people relocated away from the volcano, their lives totally disrupted and without means to take care of themselves, they were left to rely on government resources for food and shelter. For most tourists, their major disruption was the airport closure for two and a half days. I'll admit that I was freaked out by the prospect of being "stuck" in Bali, potentially missing my flights to Vancouver, Hawaii and Kenya (I know, I know... first world problems). But as luck would have it, the volcano slowed its ash spew, the airport re-opened and I was able to get a flight out just a day later than originally planned (thank you EVA Air!). As a final farewell from Agung, I actually saw it from my airplane seat as I flew out of Bali. It was a bittersweet goodbye to an island that I love so much, and I already can't wait to go back (maybe for my own little remote working, mastermind retreat...? 😁). If you have any questions or comments to share about my month in Bali, hit the big button below and chat with me inside my free Facebook group. And if you're ready to see if the digital nomad, travelpreneur life is for you, grab the free checklist below. Convinced that Bali should be your next spot? What a coincidence! It just so happens that Bali is where I’m hosting my next digital nomad retreat in 2019.